"This is my son's favorite dish. He is a very persnickety eater. Serve this chicken recipe over white rice." Slice chicken breasts horizontally to yield 4 pieces. Place breasts between 2 sheets of plastic wrap and pound to 1/4-inch thin. Place flour on a plate and dredge each breast on both sides in flour. Melt butter in a large skillet over medium heat. Put chicken into the skillet and season tops with salt and pepper. Turn when nicely browned, about 4 minutes, and season again. Cook second side until browned, about 4 minutes. Transfer breasts to a plate, reserving skillet drippings. Add wine and lemon juice to the skillet, stirring to scrape up any browned bits. Simmer to reduce and thicken sauce, about 5 minutes more. 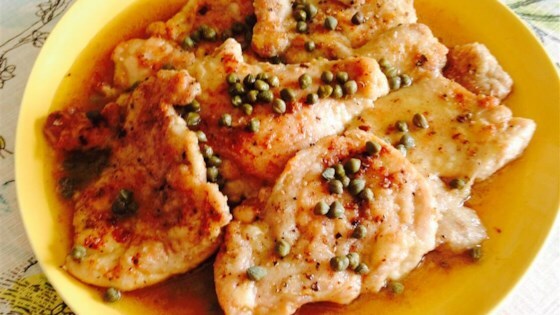 Add capers and pour sauce over chicken breasts on the plate. Sprinkle with parsley. I doubled the recipe and it turned out good. The lemon flavor is very strong so I think I will reduce the amount next time. Easy chicken recipe and very tasty too. It was easy but too lemony. I will make again but use 2 lemons vs 3. I also added fresh garlic and Italian seasoning while cooking the chicken.